Home » Our Brands » All-Flo Pump Co.
All-Flo is committed to designing and pursuing the highest quality product in the industry. These diaphragm pumps are engineered to have trouble free service life in even the toughest conditions. All-Flo pumps come in FDA approved double diaphragms. These pumps come in a variety of different options and sizes to meet the demand of your pumping needs. Pumps come in a wide variety of ranges from ¼”plastic bolted, all the way to 3” hygienic and sanitary configurations. Common applications you can find All-Flo pumps working is fluid transfer, filter-press, dewatering, spraying, cleaning, dispensing, filling and metering. All-Flo Plastic Air-Operated Double Diaphragm pumps are available in numerous different configurations, making them compatible with numerous different applications. They are available with Polypropylene, Conductive Nylon or PVDF (Kynar) wetted materials in clamped and bolted styles. The elastomers available include: Geolast®, Santoprene®, PTFE, and Viton. Connection types include ANSI/DIN flanges, FNPT and FBSPT. All-Flo Metal Air-Operated Double Diaphragm pumps are available in numerous different configurations, making them compatible with numerous different applications. They are available with Stainless Steel and Aluminum wetted materials in clamped and bolted styles. The elastomers available include: Geolast®, Santoprene®, PTFE, and Viton. Connection types include ANSI/DIN flanges, FNPT and FBSPT. All-Flo Hygenic, Sanitary and FDA Air-Operated Double Diaphragm pumps are available in numerous different configurations, making them compatible with numerous different applications. They are available with Polished or High Polished 316L Stainless Steel and Electropolished / Passivated Stainless Steel wetted materials in Tri-Clamped styles. The available elastomers include: Hytrel®, Santoprene®, PTFE and HDPE. Connection types include Tri-Clamp fittings. 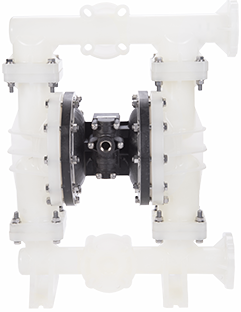 All-Flo High Purity PTFE Air-Operated Double Diaphragm pumps are available in numerous different configurations, making them compatible with numerous different applications. They are available with PTFE wetted materials with machined housings. The elastomers available include PTFE. Connection types include ANSI/DIN flanges, FNPT and FBSPT. All-Flo has their own line of pulsation dampeners, specifically suited to be used with their Air-Operated Double Diaphragm pumps. They are available in Aluminum, Stainless Steel, Polyethylene and PTFE. Elastomers include EPDM, PTEFE and Buna-N. Connections types include MPNT, MBSPT, ANSI/DIN FLange or Tri-Clamp.